SPOKANE, Wash. — The University of Washington and Gonzaga University have signed an agreement to continue, enhance and expand medical education and research in Spokane. The agreement makes Gonzaga a partner in the University of Washington’s regional, community-based medical education program and sets in motion plans to advance health related research, entrepreneurship and interdisciplinary health sciences teaching in Spokane. 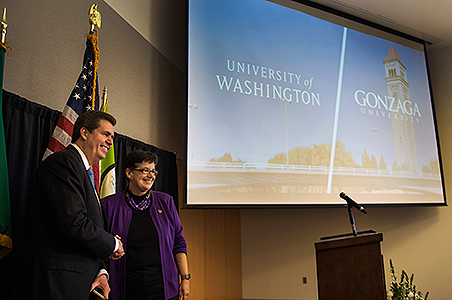 Starting fall 2016, the University of Washington School of Medicine-Gonzaga University Partnership will welcome its largest-ever entering class to dedicated facilities on the Gonzaga University campus. Gonzaga faculty will recruit, teach and mentor medical students together with UW faculty utilizing the UW’s new, award-winning medical curriculum. The UW and GU will also embark on a collaborative Regional Health Initiative to develop shared facilities and high-impact, applied research. A dedicated executive director at Gonzaga, Spokane-based UW School of Medicine leadership, and a new Community Advisory Board will guide the development of the partnership. For more than 40 years, the UW School of Medicine has provided medical education in Spokane and Eastern Washington through a five-state, community-based medical education program called WWAMI. Today, more than 500 faculty in 18 communities throughout eastern Washington serve as educators and mentors for UW medical students. This year, the UW was selected by the American Medical Association as one of 20 medical schools to join a consortium to create the medical school of the future. Driven by the determination to transform our world, the faculty, staff, and students of the University of Washington are working to find solutions to today’s major challenges, from autism and Ebola to poverty and environmental sustainability. The UW is an engaged and active community united by a steadfast belief in discovering what’s possible. With multiple campuses, a world-class academic medical center, Pac-12 athletics and extensive continuing education programs, the opportunities here are boundless. Learn more at uw.edu. Gonzaga University is focused on the goals and passions of its students. Through skilled teaching from expert professors, a proud Jesuit liberal arts tradition, and a supportive, yet challenging community, GU helps students realize immense possibilities. At Gonzaga, students become the innovative, compassionate, and courageous people the world needs today. Situated along the Spokane River near downtown Spokane, Washington, Gonzaga is routinely recognized among the West’s best comprehensive regional universities. The university offers 75 fields of study, 26 master’s degrees, doctorate degrees in leadership studies and nursing, and a juris doctor degree through the School of Law. Learn more at www.gonzaga.edu.